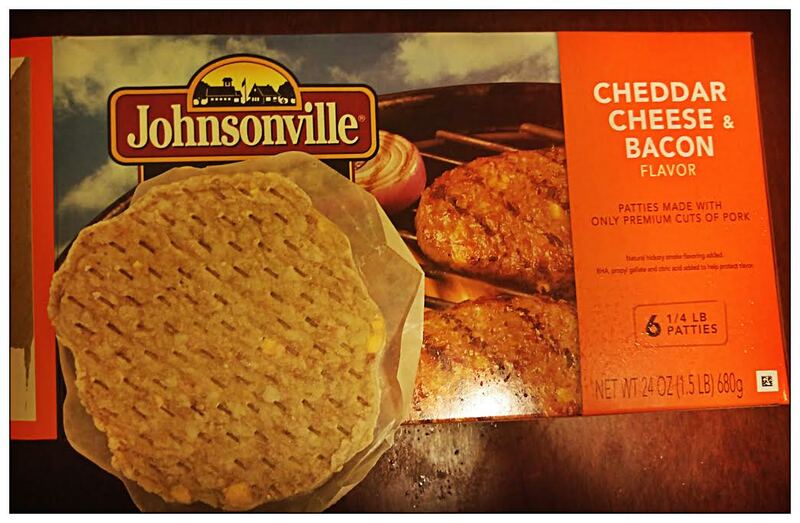 I received complimentary Johnsonville Grillers through Crowdtap to facilitate a review. This review is 100% honest from my heart (& tummy). I don’t sugar coat it, I tell it how it is. Johnsonville Grillers are pretty tasty for being a frozen pork product playing as a burger! I was hesitant to try these because the ingredients are a bit crazy and daunting to look at, the nutrition is horrible, and the flavors didn’t appeal to me tremendously. Nevertheless, I gave these a go by broiling them and eating them with garlic bread. I was pleasantly surprised! These cooked better than a frozen burger to me, they got some color and they are pre-smoked, so it tastes like you’re bite into a “real grill”-type of bite. I actually found these taste exactly like bacon pulled from a bacon cheeseburger. I would like to shave these down and top them on a real beef burger because that would be the perfect combination of cheese & bacon. I actually plated mine with garlic bread and a potato. These were a heavier bite for me, so I would have preferred a salad or something light with them. The garlic bread brought out a nice combination of flavors and I know they had a Steakhouse and Onion flavor that would probably marry well with the garlic bread. I wouldn’t put these directly on a bun, some people might, I just don’t eat bread that often. I prefer it with a beef burger or a hot dog, but this pork wouldn’t have been appetizing for me. It’s definitely not kosher as it’s 100% pork cuts, so be wary of your consumers when you take for a BBQ. These are perfect to take for a regular BBQ and as I said, you could make a box last a while if you cut them down once they are cooked. They don’t lose water like frozen burgers, they actually plumped up to me because the cheese expanded. I would definitely recommend them for pork lovers out there. Be aware that the website also indicates that these are best consumed prior to 30 days of freezing. After 30 days, I guess they lose some flavor; so, don’t stock up on these, only buy when you’re ready to use. I found that interesting as I don’t deal with much frozen pork product and never really gave much thought to the tenderloins I throw in the freezer. Let me know if you tried any of the other flavors!